In our never-ending quest to try all that Japan has to offer, I present to you… natto. It’s been sitting in our fridge for a week while I’ve tried to figure out what to do with it. I thought I’d start out easy and use it as a filling in gyoza. 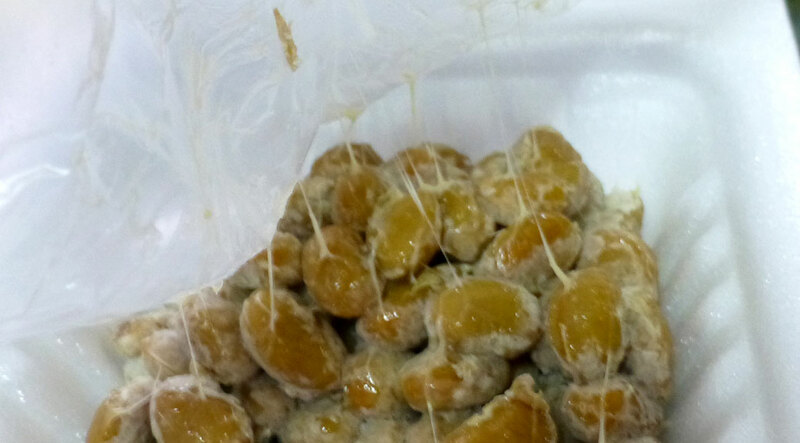 Technically, natto is a soybean that has been fermented with hay or grass bacteria. 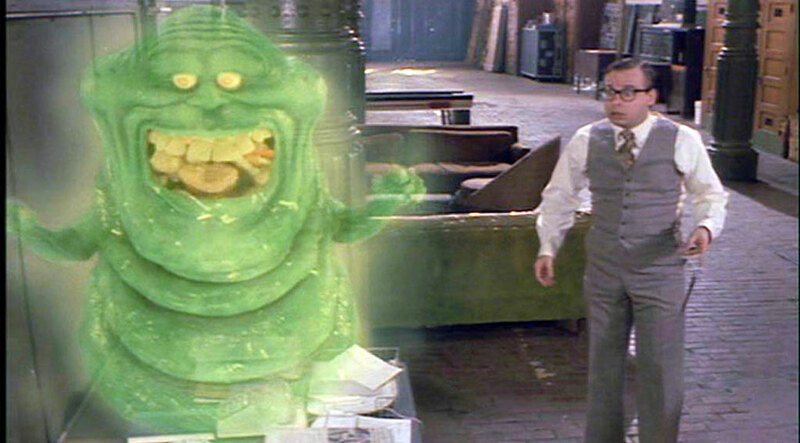 However, I’m quite certain based on its quantity of ectoplasm, that it has some relation to this guy. Slimer from Ghostbusters… a distant relative of natto? As usual, I wish I’d taken more pictures of the unboxing process as the packaging itself was impressive. Sealed in a styrofoam box, I feared the worst. Natto has a reputation of being stinky and slimy. As I opened the box, I took a good whiff. The smell didn’t bother me at all. We’re greeted with a small packet of hot mustard and another small packet, which the internets tell me contains a fish-based sauce, so I tossed that. It’s covered with a layer of wax paper, which when peeled away reveals the true nature of the beast. Apologies for the close-up. It seemed necessary. I tried it by itself first. Not an overwhelming flavor, but certainly not anything I’d want to eat plain. It has a maple-esque flavor as an aftertaste, which might be why it’s a popular breakfast food in Japan, spread on toast or rice. After mixing it with the hot mustard and some soy sauce, it was actually kinda good. Slimy indeed. I tried to use a spoon to fill the gyoza wrapper, but the natto stuck to it. So, I’d take a pinch with my fingers and stuff it in the wrapper. I looked like a first grader elbow-deep in rubber cement (do they still let kids use rubber cement?) as the sticky strings connected my fingers to the beans for a good 12 inches. When I washed my hands, the water mixed with the sticky made a slime that required a lot of washing and a strong stomach. It came in a three-pack, and I’m not disappointed. Natto spaghetti is also very popular and I found another recipe for natto veggie burgers. Can’t wait to give ’em a go! Update: So, after eating the natto gyoza, I’ve had a change of heart. There’s something just… off about it. Not sure I’m quite ready to be a fan of natto quite yet. The best way to eat natto, to me, is over rice with kimchee on top! It’s quite good! No slime eating here. Nope. Not going there. I’ll skip Brian’s bat also. That gives me the shivers.